One step forward, two steps back is the way I would describe what has been happening to the United States on the international economic development front. On one hand, U.S. exports have been picking up steam, with companies rallying behind President Obama’s call to double exports in five years. On the other hand, we have been losing tax revenue as companies seek to escape high rates and incorporate in offshore jurisdictions. It is a disturbing trend, as John McKinnon points out in his Wall Street Journal Article below. At a time when our country is facing record debt levels, we can ill afford to lose badly needed tax revenue. Yet the only way to attract capital back is not through government enforcement actions, but through adjustment of the tax code, which reduces the corporate tax rates and stimulates incorporation and economic development within American borders. I hope you enjoy the article below and as always welcome your comments. When Austin, Texas-based Freescale Semiconductor Holdings I Ltd. went public last month in the U.S., the company followed the footsteps of generations of American high-tech companies, including its former parent, Motorola Inc. But unlike its predecessors, Freescale wasn’t going public as a U.S. company. As part of a private-equity buyout that took the chip maker private in 2006, it became a Bermuda incorporated company, according to securities filings. Freescale retained its incorporation in Bermuda, a tax haven, as the company returned to public trading. 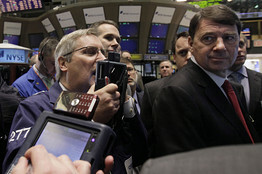 Associated Press Rich Beyer, right, Chairman and CEO of Freescale Semiconductor, watches trader activity before his company’s IPO begins trading on the floor of the New York Stock Exchange, May 26, 2011. As savvy investors and entrepreneurs search for ways to minimize the impact of the U.S. tax system, with its relatively high rates and global reach, they are increasingly incorporating overseas, tax experts say. Some private-equity firms have relocated U.S. companies or divisions to tax-haven countries. U.S. multinational companies have spun off foreign subsidiaries in tax havens. U.S. start-ups are even beginning life offshore. “It’s certainly a growing trend, and managers and firms are getting smart about it,” said Mihir Desai, a Harvard business professor. Mr. Desai calculated that in 2008, there were three U.S. initial public offerings of stock by tax-haven-incorporated companies for every 10 U.S.-incorporated IPOs. There has been no similar uptick in European markets. U.S. IPOs by companies incorporated in two tax havens—the Cayman Islands and Bermuda—have grown steadily in recent years, according to research firm Dealogic, from about 1% of the total a decade ago to 26% in 2010 and more than 21% so far this year. Most of those IPO companies are headquartered in Asia, but a substantial minority—18—have been U.S.-based. Other U.S. companies that already were publicly traded have moved to lower-tax countries through reincorporations. As other countries have reduced corporate taxes, the U.S. has one of the world’s highest top rates, at 35%, although effective rates everywhere can be substantially lower depending on tax breaks and other incentives. The U.S. also is one of the few developed countries that still seek to tax their companies’ global earnings; most countries tax only profit earned inside their borders. A decade ago, a handful of U.S. companies sought to move to offshore havens such as Bermuda to reduce their tax bills. An outcry led Congress in 2004 to bolt the door. But the law left exceptions for U.S. companies that undergo a substantial change of ownership, such as being acquired by a private-equity firm. The Internal Revenue Service in 2009 tightened the rules but left some exit doors open, for example in the case of a complete buyout. Luggage maker Samsonite, founded in Denver a century ago and more recently based in Massachusetts, is now incorporated in Luxembourg, the consequence of a 2007 takeover by private-equity firm CVC Capital Partners. With Asia now its largest market, the company went public last week in Hong Kong. It is expected to keep its tax-haven address in Luxembourg, which has a corporate-tax rate of about 22% and exempts some holding companies. Avago Technologies Ltd. began life as the semiconductor arm of Hewlett- Packard and later was part of U.S.-based Agilent Technologies Inc., an H-P spinoff. Avago retains a headquarters in San Jose, Calif. But as part of a buyout by Kohlberg Kravis Roberts & Co. and others, Avago was incorporated in low-tax Singapore a few years ago, where the company has manufacturing and other operations, as well as a headquarters. Most of its employees are in Asia. It went public in the U.S. in 2009. Freescale declined to comment. It was bought in 2006 by a consortium led by Blackstone Group, which declined to comment. Samsonite, CVC, Avago and KKR also declined to comment. The move toward offshore incorporation is likely contributing to an explosion in U.S. investment in securities of offshore-incorporated companies. Treasury data show that U.S. holdings of securities of Cayman Islands companies have grown nearly twenty-fold since 1997. U.S. holdings of Cayman securities totaled $373 billion in 2009, the latest year available, the fourth-highest total for any foreign country. It also is likely contributing to erosion of the U.S. tax base, although it is difficult to say how much. The basic outlines of the U.S. corporate-tax system are little-changed since the Kennedy years, when America didn’t have to worry about attracting and keeping business. Today, its relatively uncompetitive position is helping drive efforts in Washington to revamp corporate taxes, and these corporate-tax relocations are likely to figure prominently in the discussion. “It is troubling that today’s tax code has become so complex and the current rates so high that some businesses are making the determination that it’s more of a disincentive than an incentive for business growth,” said Michelle Dimarob, a spokeswoman for the House Ways and Means Committee, which writes U.S. tax law. Some Democrats disagree, saying tax havens are the real problem, not the U.S. tax system. President Barack Obama and lawmakers of both parties expressed interest in a corporate-tax overhaul earlier this year, but action has been delayed, particularly by the debate over reducing federal spending. United States Trade Representative Ron Kirk met today with Indian Minister of Commerce and Industry Anand Sharma to discuss a range of bilateral and multilateral issues. Ambassador Kirk reaffirmed that the U.S.-India Trade Policy Forum (TPF) is the premier dialogue for addressing trade and investment issues between the two countries. The two agreed that the TPF should be strengthened to better facilitate resolution of outstanding issues of concern, and looked forward to a constructive meeting of the TPF later this year. Additionally, Ambassador Kirk and Minister Sharma also discussed negotiations on a Bilateral Investment Treaty (BIT). Ambassador Kirk reiterated the interest of the United States in re-starting technical-level discussions between the two countries at the earliest opportunity to advance those negotiations. The two agreed that both countries should re-invigorate those negotiations by holding such discussions as soon as possible, ideally before the next meeting of the TPF. On the World Trade Organization Doha Round, Ambassador Kirk and Minister Sharma recognized the challenges that remain in ongoing discussions but expressed their commitment to exploring options for productive next steps. Washington, D.C. – The Office of the United States Trade Representative (USTR) today announced country-specific allocations of additional Fiscal Year (FY) 2011 in-quota quantity of the tariff-rate quota (TRQ) for imported raw cane sugar. TRQs allow countries to export specified quantities of a product to the United States at a relatively low tariff, but subject all imports of the product above a pre-determined threshold to a higher tariff. Today, the Secretary of Agriculture announced an additional in-quota quantity for the TRQ for raw cane sugar for the remainder of FY 2011 (ending September 30, 2011) in the amount of 108,862 metric tons* raw value (MTRV). This quantity is in addition to the minimum amount to which the United States is committed under the World Trade Organization (WTO) Uruguay Round Agreements. These allocations are based on the countries’ historical shipments to the United States. The allocations of the raw cane sugar TRQ to countries that are net importers of sugar are conditioned on receipt of the appropriate verifications of origin, and certificates for quota eligibility must accompany imports from any country to which an allocation is provided. *Conversion factor: 1 metric ton = 1.10231125 short tons. Kevin Bogardus of The Hill profiled Ambassador Kirk today. U.S. Trade Representative Ron Kirk is in for a very busy summer as the Obama administration’s top trade official. The trade agreements with Colombia, Panama and South Korea that he has been working on for more than two years are finally close to being submitted to Capitol Hill for approval, with floor votes expected possibly in July. But before those agreements are sent to Congress, the White House has demanded the approval of the expanded version of the Trade Adjustment Assistance (TAA) program. Some GOP lawmakers have balked at that request due to concerns about the deficit. “I just think it would be a huge missed opportunity for us, as a country, to not reap the economic benefits and the job-creating potential of these three free-trade agreements, frankly, over partisan politics,” Kirk told The Hill. David Segura is the founder and CEO of VisionIT, one of the largest Hispanic-owned technology firms in the U.S., headquartered in Detroit, Michigan. He is also a member of President Obama’s Advisory Committee for Trade Policy and Negotiations. David shares how America’s diverse cultural resources are enhancing trade relations and economic growth. Today, United States Trade Representative Ron Kirk hosted the Advisory Committee for Trade Policy and Negotiations (ACTPN) meeting. Ambassador Kirk, along with USTR senior officials, briefed ACTPN members on various trade issues and topics. Among the items discussed were the Trans-Pacific Partnership, and the importance of the pending trade agreements with South Korea, Colombia, and Panama and Trade Adjustment Assistance. ACTPN members were also briefed on the United States’ engagement with China and India, as well as USTR’s work on enforcing trade agreements. This week, Ambassador Kirk is meeting with Indian Minister of Commerce and Industry Anand Sharma to discuss U.S.-India trade relations. USTR.gov’s weekly trade spotlight is focusing on U.S.-India trade relations. O’Malley’s trade trip to Asia: Was it worth it? I recently was contacted by the Editor of the Maryland Business Gazette and asked to comment on whether I thought that having Maryland’s Governor O’Malley lead a business development and trade promotion mission to Asia justified the use of taxpayers’ money since most of the deals signed on that mission were pre-negotiated. My specific comments appear in the article below, but the broader issue of marquee leadership of trade missions is a rather interesting one. Although it is correct that most of the trade missions, or for that matter other political and economic development visits by top officials, usually involve a significant element of political gamesmanship and culminate in signing of highly publicized prepackaged and pre-negotiated agreements, these agreements and visits serve an important purpose. Such missions also send an unmistakable message of a country’s or state’s commitment to the proposed cause or project. In many countries a size of the visiting delegation is usually perceived as an added indicator of the visitors’ commitment and sign of serious intent. As a response, having sizable delegations led by top officials, usually causes the countries visited by such officials to put their own top-level counter-parties across the negotiating table and manage the initiative more effectively from the opposite side. These missions also serve as press and media magnets, which makes it easier to spread the message among the target audiences. They also define and shape trade policy and help set direction for the cooperating Government agencies and NGOs involved in the economic development. Where such missions can breakdown is when they lack follow through. A stand alone mission undertaken for political public relations purposes will not only be a waste of taxpayers’ funds, but is also likely to have a negative effect on both host government relations and on the local constituents. It will erode goodwill and plant seeds of skepticism and mistrust, as well as questions of fiscal mismanagement. Thus it is essential that any trade development mission be planned as part of a comprehensive and sustainable follow through effort and long-term cooperation, and not just simply as a campaign act or a political check mark. Maryland is a great example of a state focused on developing its international business and Governor O’Malley’s recent trade mission is an effective use of his stature to enhance that state’s trade and direct investment development efforts. As always I hope that you enjoy the article below and welcome your comments. While Gov. Martin O’Malley’s recent trip showcased deals between Maryland companies and Asian businesses and governments, some question whether its expense and extent were justified. “Could this have been accomplished with much less cost?” asked House Minority Leader Anthony J. O’Donnell (R-Dist. 29C) of Lusby. In a report, O’Malley (D) refers to global competition, rather than local competition, as the “true competition” that states face in this economy. But the Maryland Business for Responsive Government says it is concerned with a shifting focus from in-state business concerns to global ones.The group points to Moody’s Analytics ranking Maryland 32nd in the nation when it comes to economic outlook and Chief Executive Magazine ranking Maryland 37th when it comes to doing business. O’Donnell and Minority Whip Jeannie Haddaway-Riccio (R-Dist. 37B) of Newcomb also expressed concerns through a letter to O’Malley. The letter mentions the governor’s office reporting the trip cost about $100,000. State officials have said they are working to come up with a total cost. At his news conference Tuesday, O’Malley said he did not have the cost. O’Donnell’s letter requests an accounting for the individual costs for the 27 government-related staff, as well as unnamed staff members and the security detail. Although O’Donnell said he expects the private-sector executives paid their own way, the letter also calls for reporting any taxpayer dollars used to cover them. Experts say O’Malley’s presence was instrumental in fostering deals, even if some were prearranged. “Just because the deals may be cut before doesn’t mean he’s not cutting more deals while there,” said Peter Morici, a business professor at the University of Maryland, College Park. He said Asian government and business officials typically place a great deal lot of importance on a government presence went it comes to economic development, so a governor’s presence has an impact. For example, BlueWing Environmental Solutions & Technologies’ deal with Vietnam Natural Resources and Environmental Corp. was facilitated by O’Malley’s support, said Kevin E. Hedge, CEO of the Ellicott City company. Most business deals in Vietnam go through its government, said Peter Gourlay, president and founder of the Maryland-Asia Environmental Partnership. Lin Hwang of J&R Seafood agreed that the governor’s presence lends credibility. “Most emerging countries appreciate it very much,” Alexander M. Gordin said of a governor’s presence on a trade mission. Gordin is a trustee of the Princeton Council on World Affairs and international trade expert with the Broad Street Capital Group in New York. The trade mission shortened Planned Systems International’s contract cycle by six months, saving the Columbia company thousands of dollars, CEO Terry Lin said. He said such contract negotiations can be especially difficult, so having a significant presence such as O’Malley’s was helpful. Gordin said the governor’s presence sends a message that the U.S. sees global trade as especially important. He added that having the governor actually addressing the foreign groups also helps differentiate the state within the U.S. and helps other countries understand they are working with Maryland specifically. He said such missions build long-term relationships and that nothing will ever replace face-to-face discussions when it comes to commerce. Lusaka, Zambia – This week, during a trip to Lusaka, Zambia for the 2011 African Growth and Opportunity Act (AGOA) Forum, United States Trade Representative Ron Kirk announced a new Obama Administration initiative to build trade capacity called the African Competitiveness and Trade Expansion (ACTE) initiative. ACTE will provide $120 million over four years to build on the success of Africa’s regional trade hubs and help African nations to realize AGOA’s full potential. The announcement came during remarks at the Forum’s Ministerial Opening Ceremony on Thursday, June 9. Present were Zambian President Rupiah Banda and Minister of Commerce, Trade and Industry Felix Mutati, Obama Administration officials and delegates from over 30 African countries. At the Ceremony, Ambassador Kirk delivered a special greeting from President Obama and highlighted AGOA’s success in expanding exports from Africa to the U.S. He also announced the Obama Administration’s intent to work with Congress to extend AGOA’s third-country fabric provision through 2015. This important provision allows eligible AGOA countries to export apparel products made with textiles from foreign countries duty-free to the U.S. In addition, he noted that the Obama Administration will work with Congress towards a seamless renewal of AGOA beyond the current 2015 expiration. During the Forum, Ambassador Kirk met with Secretary-General Dr. Richard Sezibera of the East-African Community (EAC) and trade ministers of the five EAC member countries. He discussed with them a new U.S.-EAC initiative focused on regional integration that will include as one of its core elements a regional investment treaty. He also held bilateral meetings with President Banda, Minister Mutati, Trade Minister of Ghana Hannah Tettah and Swaziland Senator and Minister of Commerce, Industry and Trade Jabulile Mashwama. Ambassador Kirk discussed with these leaders strategies for diversifying exports and specifically how AGOA can be used as part of that strategy. While in Lusaka, Ambassador Kirk toured FreshPikt, a canning facility. While there, he participated in a signing ceremony to mark a joint venture between FreshPikt and American investor, PS International. PS International is in the process of purchasing a majority stake in FreshPikt, valued up to $30 million. This venture will expand the production of tomato paste for local and regional markets, and will eventually source all inputs from local Zambian farms. Currently, FreshPikt-owned farms supply 50 percent of the factory’s inputs, with the rest coming from nearly 1,200 small-scale Zambian farmers. On Friday, June 10, Ambassador Kirk joined Secretary of State Hillary Clinton for the Ministerial Closing Ceremony of the Forum, followed by a dinner hosted by President Banda at the State House. At both events, he expressed his gratitude to President Banda and the Zambian government for welcoming him and the rest of the U.S. delegation to Zambia and for the excellent job Zambia did in hosting the 10th AGOA Forum. He then concluded his trip by joining Secretary Clinton for a ceremony marking the launch of the first-ever Zambian-American Chamber of Commerce (AmCham). Among the more than 20 charter members of the chapter are Citibank, Cargill, Price Waterhouse Coopers, Freeport McMoran, Pioneer-Dupont, and Microsoft. This new AmCham will compliment the work of the newly-formed U.S.-Zambia Working Group on Bilateral Trade and AGOA, and encourage mutually beneficial U.S.-Zambia joint ventures. AGOA was enacted by Congress in 2000. It serves as a cornerstone for U.S. economic engagement with Sub-Saharan African nations and encourages the growth of their economies. AGOA allows duty-free access for African exports, covering ninety-eight percent of the products the 37 eligible African countries send to the U.S market. This year marks the 10th annual meeting of the AGOA Forum, which brings together hundreds of U.S. and sub-Saharan African government officials, as well as the African and American private sector and members of the public. The 2011 Forum’s theme was “Enhanced Trade through Increased Competitiveness, Value Addition and Deeper Regional Integration.” Ambassador Kirk and Secretary Clinton led the U.S. delegation to the Forum. Other representatives from the U.S. included senior officials from various federal government agencies including USTR, the Departments of State, Commerce, Treasury, Transportation and Agriculture, the U.S. Agency for International Development (USAID), the African Development Foundation and Millennium Challenge Corporation (MCC). Whether its business or geopolitics, understanding mentality and culture of the foreign counterparts is crucial to achieving tangible and mutually beneficial results. Number of factors comprise what we often call cultural identity. Games people play in their respective countries often shape their way of thinking and at the same time can act as superb guiding indicators to the way people of in foreign countries approach problems and negotiations. Whether its Risk, Monopoly, Chess, Backgammon, Wei qi, Bridge, Poker or multitude of other board and card games, it is possible to analyze their effect on individual’s behavior and extrapolate certain common characteristics, which then can be effectively used in cross-border dealings. Article below illustrates this concept using the example of the ancient wei qi (aka GO) game and its effect on the thinking of the Chinese people. A 2,000-year-old board game holds the key to understanding how the Chinese really think—and U.S. officials had better learn to play if they want to win the real competition. That’s the pitch that David Lai, a professor at the Army War College, has been making in recent months to senior military officials in the U.S. and overseas. Learning the ancient board game of wei qi, known in the U.S. as Go, can teach non-Chinese how to see the geostrategic “board” the same way that Chinese leaders do, he says. 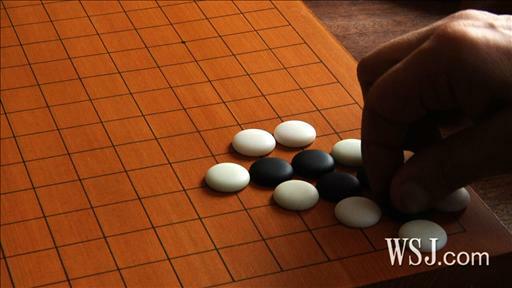 Wei qi, the game of “surrounding,” has long been popular in the East — known as Go in Japan and Baduk in Korea. Now, U.S. military officials are looking at the game in an attempt to understand how the Chinese really think. WSJ’s Christina Tsuei gets a lesson on the game from 35-year GO veteran Jean-Claude Chetrit. The game, already well known in the days of Confucius and still wildly popular in Asia, is starkly different from chess, the classic Western game of strategy. The object of Go is to place stones on the open board, balancing the need to expand with the need to build protected clusters. “Go is the perfect reflection of Chinese strategic thinking and their operational art,” says Mr. Lai, who grew up watching his father—who was jobless during the turmoil of the Cultural Revolution—constantly play the game. A self-described midlevel Go player, Mr. Lai came to the U.S. about 30 years ago. 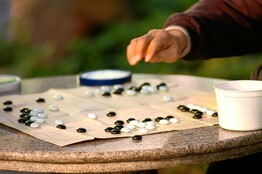 Mr. Lai’s best-known work about the nexus between Go and Chinese geopolitical strategy is a 2004 paper called “Learning From the Stones,” a reference to the 361 black and white stone pieces that eventually fill the 19-by-19 Go board. He described China’s long-term and indirect approach to acquiring influence. He also zeroed in on concrete geopolitical challenges such as Taiwan, which he described, in terms of Go, as a single isolated stone next to a huge mass of opposing pieces. As Chinese leaders see it, he suggested, Taiwan was a vulnerable piece that the U.S. should want to trade away for a better position elsewhere on the board. The U.S., by contrast, sees Taiwan not as a bargaining chip but as a democratic ally that it has supported diplomatically and militarily for more than 60 years. Mr. Lai’s paper caught the attention not only of his then-bosses at the Air Force’s Air University in Alabama but of former Secretary of State Henry Kissinger, who quickly became a convert to his way of thinking. Throughout his new book, “On China,” Mr. Kissinger uses wei qi to explain how Chinese leaders such as Mao Zedong and Deng Xiaoping managed crises during the Korean War, disputes over Taiwan, the Vietnam War, conflicts throughout Southeast Asia and with the Soviet Union, and the normalization of relations with the U.S. In the first days of the Korean conflict, for example, President Harry Truman sent U.S. troops to South Korea and the U.S. Navy to the Taiwan strait. He had, “in Chinese eyes,” Mr. Kissinger writes, “placed two stones on the wei qi board, both of which menaced China with the dreaded encirclement.” Thus, despite being war-weary and impoverished, China felt the need to confront the U.S. directly. The game can also be used to interpret recent Chinese behavior. Consider China’s participation in antipiracy efforts in the Indian Ocean—the first time that China has undertaken blue-water naval operations in support of an international coalition. The West tends to see such cooperation as responsible behavior on China’s part. But a strategy paper published last December by the Central Committee of the Chinese Communist Party offers a different view: that antipiracy operations can help China to subtly gain a foothold in a vital region. “China can make use of this situation to expand its military presence in Africa,” the paper said. One of Mr. Lai’s first fans was Air Force Gen. Steve Lorenz, formerly the head of Air University, where Mr. Lai then taught. Gen. Lorenz heard one of his lectures in late 2005 and summoned him for a full briefing about the insights that Go could offer. In recent months, Mr. Lai has briefed officers at Pacific Command, the U.S. Air Force Global Strike Command, the Center for Army Analysis and the Australian Defence College. U.S. defense officials regularly receive strategy briefings from outside experts, and the U.S. military regularly taps ancient classics such as Sun Tzu’s “The Art of War” and Xenophon’s “The March of the Ten Thousand” to help educate modern officers. “You’ve got to think like the other guy thinks,” said the officer, who spoke on the condition of anonymity. Mr. Lai’s theories are not universally embraced by China experts. For starters, some say, comparing national strategic thought to popular sports and games is an over-simplification—and at any rate, the Chinese version of chess has lots of adherents in China, too. Furthermore, despite the ancient roots of Chinese military thinkers such as Sun Tzu, it’s far from clear that Chinese leaders over the millennia, especially Communist Chinese leaders, have followed a single, broad strategy at all, let alone the one sketched by the board game. “Go is a very useful device for analyzing Chinese strategy, but let’s not overdo it,” says James Holmes, an expert on Chinese strategy and professor at the Naval War College. He notes that China’s “amateurish” diplomatic blunders in recent years, including bullying neighbors and trying to push other navies out of international waters, represent a departure from the patient, subtle tenets of Go. 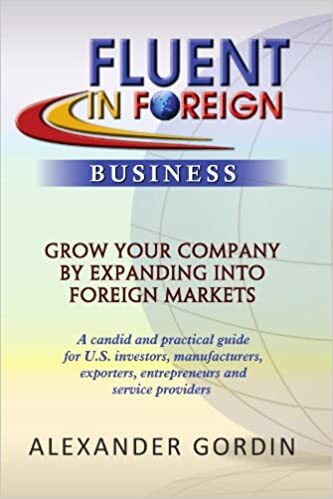 In “Fluent In Foreign Business”, I extensively discuss the need to thoroughly understand the investment climate of chosen foreign markets, as many times booming economic signs mask significant economic, political or social problems. The article below is a good illustration of how smart money is leaving what on the surface appears to be a terrific and attractive Russian market. MOSCOW: The billions of investor dollars fleeing Russia each week offer a stark counterpoint to Moscow’s aspirations of soon becoming a global financial centre linking London with Hong Kong . The world’s leading oil exporter finds itself in the odd position of being flooded with petrodollars and seeing remarkable ruble strength — two prime conditions for local investment — while also bleeding capital at record rates. The outflow of investor money abroad reached $30 billion by the end of April to nearly match the 2010 total. The May figure is expected to approach $8 billion and a slowdown is not anticipated for some months. “It is difficult to give a simple and clear explanation as to why this is happening,” Russian Central Bank chairman Sergei Ignatyev acknowledged. Investors may argue that Ignatyev was gilding over a graft problem so blatant it saw Russia rank 154 out of 178 countries on last year’s Transparency International Corruption Index. The World Bank says Russia is the world’s second-most difficult country in which to get a construction permit while local entrepreneurs often treat law enforcement authorities and the courts as a part of the same system. “When you talk to investors, that really is one of their biggest points,” said chief UralSib strategist Chris Weafer. The real mystery is why this scramble to get out of Russia is getting more frantic at precisely the moment when the government is pursuing one of its most market-friendly programmes in years. President Dmitry Medvedev is now courting Westerners with a $10 billion joint investment fund and hoping to put meat on the bones of his modernisation effort by dislodging state appointees from their seats on company boards. Both measures fold into a broader $60 billion privatisation programme aimed at giving Moscow its coveted status of being a centre of global finance. Uncertainty over whether Medvedev or his mentor and predecessor, Prime Minister Vladimir Putin will head the Kremlin next year, may be one of the factors behind investors’ latest spell of jitters. But analysts note that Putin’s return has been rumoured since the final day of his second term in 2008 and can hardly explain why the outflow of currency has nearly tripled in recent months. There are other more technical factors also at play. Russia’s inflation expectations are rising and squeezing holders of local currency bonds. But the help these investors have been getting from a stronger ruble will expire once oil prices climb off their recent highs. “I think most of the capital flight is associated with this,” said Renaissance Capital economist Ovanes Oganisyan in reference to ruble bond sales. Other factors may be the record dividends — sometimes as much as 90 percent of profits — paid by such local giants as the British joint venture TNK-BP. But analysts say that behind all these immediate variables is buried a more fundamental investor doubt about Russia as a future growth market. The government is gradually raising tax rates on energy producers to cover the tens of billions of dollars in outlays it has promised ahead of the approaching elections. Manufacturing growth slowed to just above stagnation level last month while Gross Domestic Product growth has barely reached half the rate seen before the global slump in 2008. “People are starting to realise that the levels of growth we have seen in the past decade are not sustainable without major reforms and major investment,” UralSib’s Weafer said. An Oliver Wyman financial service partner who recently compared Moscow to other financial centres, showed the Russian capital ranking behind cities such as Manila and Jakarta. The survey recommended “strengthening regulatory requirements and oversight, improving disclosure … and modernising corporate governance standards,” the agency’s Robert Maciejko wrote in the Wall Street Journal. “In the absence of efforts on the part of the Russian government to reduce the risks of investments in Russia, one can hardly expect private capital inflows into the country,” the Gaidar Institute said in an annual report. Analysts said the only silver lining was that capital flight was putting the breaks on runaway ruble appreciation. “This is a comfortable situation for the government — they like the fact that something is keeping the ruble from gaining too much,” said Oganisyan. Ambassador Kirk and EPA Administrator Lisa Jackson hosted a meeting of the Trade and Environment Policy Advisory Committee (TEPAC) on June 2 at USTR. This is the fourth TEPAC meeting that Ambassador Kirk and Administrator Jackson have co-hosted. Ambassador Kirk provided updates on the trade agreements with Korea, Colombia and Panama, on recent developments with Trans-Pacific Partnership (TPP) negotiations, APEC and WTO Doha negotiations, including a read-out of his recent meetings in Big Sky, Montana. Administrator Jackson highlighted that the Administration is working on a new strategy for electronic waste. TEPAC members focused in particular on fisheries subsidies, thanking USTR for U.S. leadership in the WTO and TPP, and on environmental goods and services, including U.S. aspirations for the Leaders Meeting in Honolulu in November. Assistant USTR for Environment and Natural Resources, Mark Linscott, provided a detailed assessment of TPP negotiations on environment, including highlighting the U.S. proposal on wildlife and wild plant (e.g., forestry) conservation. Ambassador Marantis Joins Senator Mark Warner To Host a Town Hall Meeting in Herndon, Virginia 06/03/2011 Recently, Ambassador Marantis joined Virginia Senator Mark Warner for a town hall meeting at the Hewlett-Packard headquarters in Herndon, Virginia. Taking questions from the audience, Ambassador Marantis highlighted the Obama Administration’s agenda to foster sustainable growth and create well-paying American jobs through trade. Ambassador Marantis with Senator Warner and HP Executives The Ambassador’s remarks focused on the U.S.-South Korea Trade Agreement, the Trans-Pacific Partnership (TPP) trade negotiations, and his recent participation in the 2011 Asia Pacific Economic Cooperation (APEC) Ministers forum in Big Sky, Montana. Each of these initiatives highlights the importance of the Asia-Pacific region to both the U.S. and Virginia economies. With the region accounting for 44 percent of global trade and 40 percent of the world’s population, breaking into and staying in these markets is vital to growing Virginia’s $17 billion in goods exports, as well as its services exports. Increasing Virginia’s exports will also have a significant and positive effect on export-supported jobs. Nearly one-fifth of Virginia manufacturing workers depend on manufacturing exports for their jobs. As the world’s largest information technology company, it is no surprise that HP webcast the event to its 325,000 employees worldwide – allowing an audience member in Paolo Alto, California to ask a question on the pending trade agreements and an audience member in India to inquire into U.S.-India trade relations. Ambassador Marantis would like to thank Senator Warner and the entire HP team for organizing such a wonderful event. We recently received a question from Anna in Maryland about the U.S.-Korea trade agreement and growing American jobs. “In light of the recent FTA with Korea, will that increase or have a significant impact on U.S. jobs? If so, in what industries may we see this impact take place?” Ambassador Kirk responds: “The U.S.-South Korea trade agreement is estimated to increase U.S. exports to Korea by $10-$11 billion annually. And that is just the result of removing South Korea’s tariffs on U.S. goods. All these increased exports are estimated to support at least 70,000 additional U.S. jobs. But it does not stop there. When you add in the effects of the agreement’s many provisions that eliminate non-tariff barriers and strengthen the protection of intellectual property, for example, we believe the actual increase in U.S. exports will be even higher, which means more U.S. jobs. Also, Korea has a $580 billion services market, where the U.S. already competes very strongly. The agreement opens up that services market even more, which will mean even more exports of American services to Korea, which in turn means even more U.S. jobs. With South Korea being a developed, $1 trillion economy, the agreement will benefit American exporters – and therefore help create additional jobs – in a broad range of industries and sectors, from machinery, aerospace, and medical technology, to express delivery services and insurance, and most everything in between.” Thank you for continuing our dialogue on trade. Please keep submitting your questions and comments for the Ambassador. Ambassador Kirk On Reuters Insider at the 2011 OECD Forum 06/01/2011 – 5:16pm In Paris last week at the 2011 OECD Forum, Ambassador Kirk spoke with Reuters Insider regarding the Doha round o ftrade negotiations. Conference 06/01/2011 – 4:43pm During World Trade Week and National Small Business Week, Deputy Assistant USTR for Small Business, Market Access and Industrial Competitiveness Christina Sevilla had the opportunity to address a conference titled “Futurallia 2011” in Kansas City, Missouri. The conference included over 600 small businesses from across America and 27 other countries. Her remarks focused on the work the United States and our trading partners are undertaking to better support small businesses growth and prosperity through exporting. For example, USTR is working within the Trans-Pacific Partnership to emphasize the needs of small- and medium-sized businesses. This emphasis will help these businesses participate more actively in Asia-Pacific trade and address trade barriers that affect access to these markets. The United States also convened the first ever joint meeting of Asia-Pacific Economic Cooperation (APEC) Trade and SME Ministers in Big Sky, Montana last week. The ministers worked to find ways to address barriers to trade that particularly impact small businesses, and make it cheaper, easier, and faster to trade within the region. At the conference, Christina met with Missouri small businesses seeking to expand their exports into new foreign markets, including Western Forms, a small manufacturer from Kansas City, which has 100 employees and exports aluminum molds for concrete housing to 40 countries. Company manager Dan Ward expressed his support for free trade agreements, saying “We have customers in Colombia and Panama. [Trade agreements] would help us create more jobs in Kansas City.” Another small company, SComm, has 10 employees in Raytown, Missouri and exports a patented portable device, the UbiDuo, which helps deaf and hard of hearing people communicate more easily. SComm Vice President Emma Curry said the company has exported to various U.S. free trade agreement partners, including Canada and Australia, among other countries. They are also interested in increasing sales to more foreign customers in additional countries around the world. Expanding exports by America’s innovative small- and medium-sized businesses is a key priority of the Obama Administration’s National Export Initiative – which is working to double exports by the end of 2014 and support jobs here at home. Watch Ambassador Demetrios Marantis’ Testimony before the Senate Finance Committee 05/26/2011 – 9:47am Today Ambassador Demetrios Marantis is testifying before the Senate Finance Committee to discuss the U.S.-South Korea trade agreement. You can watch the hearing live on the Committee’s website here starting at 10:00 a.m. ET. Video: Ambassador Kirk on Small Businesses Benefiting from Trade at OECD 05/25/2011 – 3:28pm Ambassador Kirk is in Paris, France at the OECD Ministerial today. Watch a short video below on how USTR is working to make it “cheaper, simpler, and faster” for American small businesses to export and grow. On Tuesday, Ambassador Kirk met with Trade Minister Mari Pangestu of Indonesia for a wide-ranging discussion of the bilateral trade relationship. They welcomed progress made in advancing the relationship between the two countries and agreed to hold the next meeting of the U.S.-Indonesia Trade and Investment Framework Agreement in the next few months in Washington, D.C. Ambassador Kirk and Minister Pangestu In addition, Ambassador Kirk and Minister Pangestu agreed to explore ways to expand bilateral cooperation on trade and investment issues. This includes facilitating the expanded engagement of U.S. and Indonesian business leaders in upcoming discussions. Ambassador Kirk emphasized the importance of making progress on outstanding market access issues, including customs procedures restricting U.S. exports of movies to Indonesia. They also discussed the status of the Generalized System of Preferences program. The two ministers exchanged views on the Doha round of negotiations and on the work they were doing together in the Association of Southeast Asian Nations (ASEAN). The U.S.-Indonesia trade relationship is growing rapidly. In 2010, U.S. goods trade with Indonesia rebounded from the global economic downturn by increasing to an all-time high of $23 billion, up 30 percent from 2009. U.S. exports led the increase, up 36 percent to $6.9 billion last year, supporting well-paying jobs here at home.